So in our preparation, we booked a 5/7 seater to accommodate Granny and Grandad who were joining us. We expected a Renault Scenic or Ford C Max as per booking arrangements, but on arrival we got a High Spec Citroen C4 Grand Picasso! The excitement from the kids was unreal, as they claimed to know every nook and cranny and gadget in the car. The main differences and similarities we found were both beneficial and futile at different times throughout the holiday. The first huge benefit was the SAT NAV! So in Ireland, this isn’t as much a requirement for us, but in France, it was a godsend and personal aide. Despite having some knowledge of the region from previous trips, we explored further and became efficient in our own short journeys. Also an absolute necessity was the Air Conditioning – which was a staple every day in the 29 degree heat. One thing we noticed was the lack of the panoramic roof window, and given that it’s not exactly blue skies every day in Ireland, we noticed how dark the car was especially with all 7 seats in use. That noted, the tinted back windows were also very advantageous to take away from the glare, especially when Harry was sleeping in the back. Our journeys took us from Carcassonne to Banyuls sur Mer, and in particular around the beautiful coastal village of Coillure. Having never driven anywhere but Ireland, Coillure was not the ideal location to attempt driving on the opposite side of the road with left hand drive! But needs must, and one fine day, the car was parked a kilometre outside of the village (up a very steep hill), so I went to get the car. Then I realised the benefits of all the electronic sensors and gadgets the Picasso had to offer. The electronic handbrake was excellent for hill starts (and there were many), the front sensors kept me on track on the very narrow streets behind the village market and the sat nav on the largest zoom took me through the village in no time. At one point, I had turned up a little hill which was a dead end and found myself needing to turn the car on a hill which was only one car wide! But panic not – the Picasso turned very easily aided by the rear and front sensors and the rear camera. We also found the car to be extremely efficient on fuel – using barely €30 in diesel for the week we had it and all the travel we did. On arrival back to Dublin, despite the dreary rain, we were actually glad to have the Picasso to step into again for our journey back to Galway. 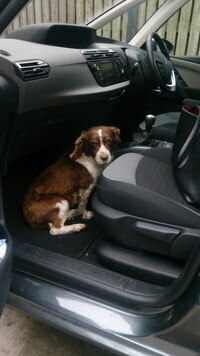 Once we were home and unpacked, we had our dog Poppy sit up in the front of the car waiting to go down to the woods for her walk! February to March has been eventful, every week finding new gimmicks and tricks with our new Picasso! Firstly, Harry has taken up an interest in driving it, he first told us he wanted a quad bike, but is now more interested in our fancy Picasso, with its Push Start and very high tech touch screen controls in the centre console! We thought he was very smart mastering a SKY remote at 2 years of age, but at 4, he can set the heat controls, get to the Sat-Nav and navigate between the MP3 player and iPod we have hooked up to the stereo! 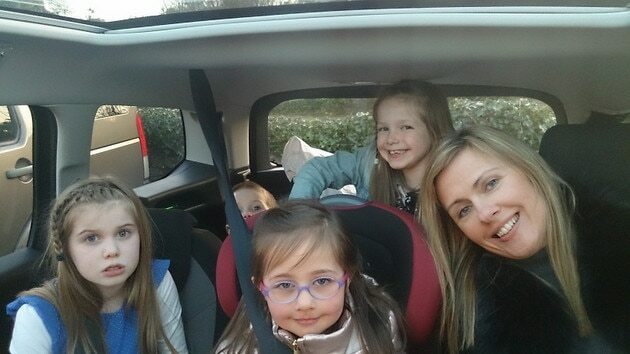 Saturday mornings are usually hectic, between dancing class, food shopping and trips around town, but our bright sparks thought it would be ideal to have a little play on the first fine day – in the boot of the car, which they tell me is bigger than their tent! They can open the boot by the key or touch of the tailgate, and had themselves lined up with seats and snacks to settle down for a play last week. While the kids were having their little play in the boot, they also mastered how easy it was to pop up the back 2 seats to make it into a 7 seater, and put them back! Big plus for the kids is being able to regulate the car temperature with the rear temp controls and they also found a torch slotted into a little compartment in the boot when we were putting in our first aid kit! We think this is very neat! We had a journey soon after with some of our extended family and there was lots of room. We’ve also had occasion to have 3 adults sit in the back and they all found it extremely spacious with plenty of leg room. Luckily Mam needed the car next for a massive office move between Tullamore and Athlone with Youth Work Ireland Midlands. The van we hired for the move was full of pool tables, kitchen ware and sports equipment, but all I needed was one load to move my office gear. So with the help of 3 strapping lads (all 6 foot tall) we managed to fit in my flat packed desk, office drawers, filing cabinets and boxes, as well as fitting in the kids 3 car seats for the way home. With all this travel, you might question how efficient the car is. Well, having monitored the fuel consumption over 6 weeks, I can say it has gradually evened out. While a full tank estimates 800 km, I’m probably getting closer to 870 – 890 km per tank. Again, longer journeys, more even surfaces are easier on the car, but that said, I’m finding the Picasso surprisingly fuel efficient and cost effective. Our new car has quickly become part of the family, from it’s sensitivity to the wall on the driveway (sensors) to the ability to see around corners (spotlights!) Carly is telling everyone the car has eyes! These sensors even detect when the cat or dogs are behind the car. So far the best part for us as a busy family is the internal SPACE that the car provides, from a large boot, to extra leg room, to full size seats to accommodate 3 booster seats in the back. Friday Food shopping, 3 school bags, coats and other end of week paraphernalia all fit nicely in the very deep boot. Visibility is superb out every window, making blind spots almost a thing of the past. That said, the wing mirror blind spot detectors are very handy, particularly on motorways or in heavy town traffic. A very smooth and quiet drive, it’s sometimes hard to see if the car is stopped or running, particularly when the ECO function kicks in, (when we’re stopped at traffic lights). Very light steering, with sensitive turning – this is extremely useful when parking. School mornings are crazy as ever, but with the race to open the boot and fill it with as much as possible, we are getting a sense of having a cleaner car, because there is a lack of school bags, handbags, lunch and sports gear which is usually at everyone’s feet! We have a busy February ahead, with many more road trips ahead. 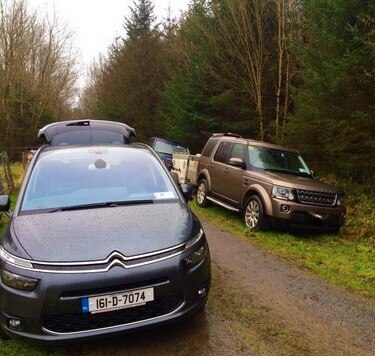 Meet the Hyde Family from Ballinasloe, Co. Galway, the new Citroën Ambassador Family for 2016. The family recently picked up the keys of their new Grand C4 Picasso and are thrilled at the prospect of getting behind the wheel of Ireland’s most popular seven seater. The family is made of Tracey Hyde (who entered the competition on the Nicky Byrne Show on 2FM last November), her husband, Tim, and their three children, Harry (4), Lexi (6) and Carly (8). 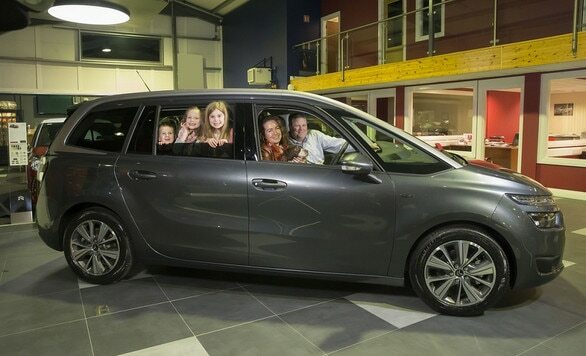 The family also have three dogs so with such a big family are sure to get the most out of their new Grand C4 Picasso!